This video is for the intermediate to advanced players that are already beating 100NL or 200NL games. I play only two tables of 6 max 200NL at Full Tilt Poker and play a loose aggressive preflop game. I didn’t prepare this video to be about squeeze plays and 3-betting light, but the situations kept arising and I was perfectly willing to take them. Micro stakes players can still learn a lot from this training video, but using a lot of preflop aggression is going to increase your variance and isn’t necessary to win. On the other hand, small stakes players can improve their win rate with the lessons from this training video because these moves take advantage of thinking players. A squeeze play is when a loose opponent (let’s call him #1) makes a preflop raise, a smart villain (#2) calls, and then you make a large raise over both of them. The goal of a squeeze play is to gain massive amounts of fold equity and take down the pot immediately, which means it is normally done as a bluff. 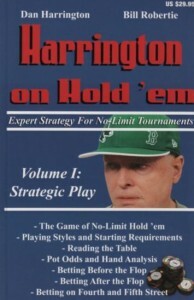 I originally learned about this move after reading one of my favorite poker books, Harrington on Hold ‘em Vol 1. The reason the squeeze play works so well is because both players are likely to be holding good, but not great hands that will have to fold to our large reraise. This is why it is crucial that villain #1 be a loose player at the table. This makes player #2 call with a wider range of hands than normal because he knows villain #1 has been raising a lot. When you come over the top with a squeeze play, both players are in a tough spot. Villain #1 would need a very premium hand to continue on against two other players that have already shown that they like their hand. Once #1 folds, villain #2 is likely going to fold because his pot odds with his medium strength hand are no good. We can almost always rule out a strong hand by Villain #2 because they would likely 3-bet the loose player preflop instead of just calling with hopes of seeing a flop. The squeeze play can also be used when there are multiple callers in the pot, but it always involves a loose villain #1 raising. Make sure you raise a little extra to negate pot odds for each player in the hand though. The downside to this is there always seems to be that one guy that wants to make the big preflop call when you squeeze multi-way. You have to be willing to make a 50-60% pot continuation bet on most flops, which will quickly lose you money if you are wrong. If you would like to know more about this move, check out The Squeeze Play strategy article. I also cover a good concept that I learned from watching a video by TheBryce of the CardRunners training site. He states that to play a poker perfect hand, you must do two things. Both of these tasks may be difficult to accomplish in a given hand, but this is how you should be thinking about poker. You need to figure out what possible hands your opponent could be playing and you will see examples of this throughout all of my training videos. Once you figure out what hands they might have, you need to come up with the most profitable action against that range. Each different move you learn on PokerTrikz can be used to extract value from a different range of hands. For each new strategy you learn, you will have a larger arsenal to extract more value from your opponents. *I would also like to note that the phrase “extract max value” should also reference losing the smallest amount whenever your hand is behind the opponent’s assigned range. If you are looking to take your poker training to the next level, CardRunners.com is the website to check out. CardRunners is a paid poker training site that was one of my original inspirations for PokerTrikz. I had a paid membership to CardRunners for three years and never would have improved so quickly if it weren’t for them. There are amazing training videos from some of the greatest online poker players ever – GreenPlastic, CTS, sbrugby, Stinger, and the above mentioned TheBryce just to name some of my favorites. CardRunners is currently offering a 7-day free trial when you sign up for an account and membership. You have to give your payment details up front when you order a membership, but you can cancel at any time in the first 7 days and you won’t be charged. I’ve had PokerTrikz members use a free trial and cancel, only to become a full time member just a few months later when they started earning money from poker.